LapSim wants to provide a fast, comprehensive and easy to use simulation package for your racing activities, anything from a professional racing outfit running a full aero racecar to an amateur preparing and driving his own car. We believe in our approach and are confident that if you invest your time and are looking for simulation software, LapSim will convince you. If you subsequently purchase a license you will know exactly what you are getting. The software used for all the licenses is the same and available in the free download. A free version has been available from 2004 onwards, due to which no other race simulation package is so extensively tested and used as LapSim for the widest variety of vehicles. From our perspective simulation is always a simplification of a complex reality. Simplification does certainly not mean useless, it all depends what is the goal to analyse. Most important is to be aware of the simplifications of the model and if these simplifications might have an effect on the conclusions one draws out of the behaviour of the simulation. One should see the free version as a clear exponent of this thought. 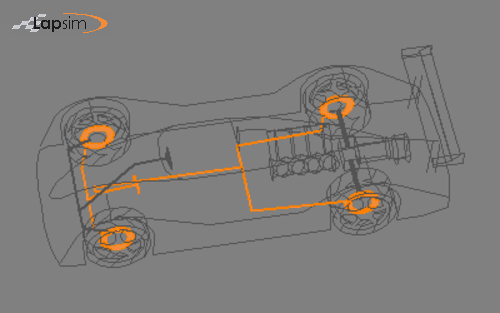 Although very limited in the amount of parameters one can edit to describe the vehicle, one should still be able to get the simulation close to the behaviour of the real vehicle, proving the statement that a 'simple' model can still generate a relative good correlation.